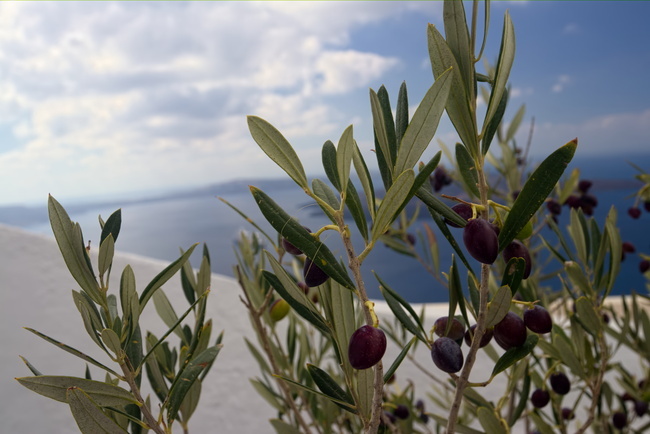 Olive trees are less common on Santorini than elsewhere in Greece, but they retain thier status as a central cultural symbol, stretching back to the importance associated with Athena's gift of an olive tree to the newly-built city in Attica during her competition with Poseidon to become its namesake and protector. Poseidon, with his gift of a spring that turned to brine, lost ignominously. Athena, with a gift that provided both shade and a cooking staple, won and has been honored since. In this photo, we see a young tree, growing in a planter near the edge of a hotel's property, that is fruiting with olives. The silvery undersides of its elongated simple leaves are in contrast with the dark, upper surfaces colored in characteristic olive drab.